William III. invited Abauzit to settle in England, and ordered Michael le Vassor to offer some advantageous | proposals; which, however, were not accepted. Filial aflectioil, or attachment to the country in which he had obtained a refuge, recalled him to Geneva; where, in 1723, the University offered him the chair of philosophy, which he declined, ple‘ading the weakness of his constitution, and his inability to do credit to the appointment. Jn 1726, he lost his mother, to whom he had ever been most affectionately attached. 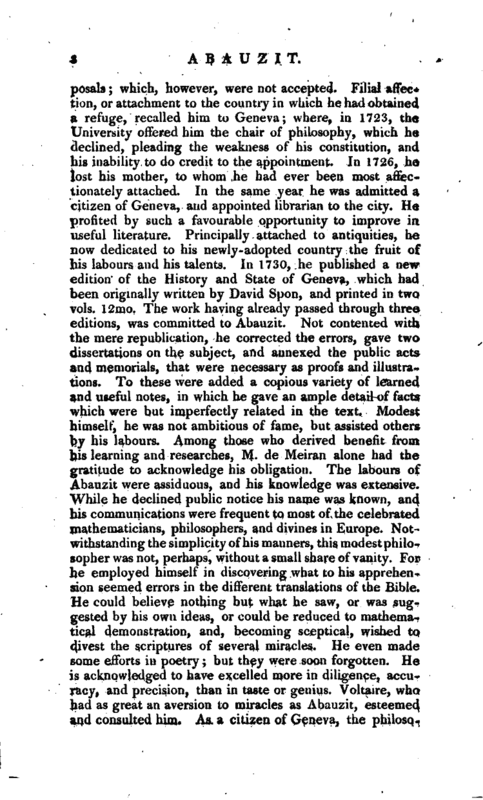 In the same year he was admitted a citizen of Geneva, and appointed librarian to the city. He profited by such a favourable opportunity to improve in useful literature. Principally attached to antiquities, he now dedicated to his newly-adopted country the fruit of his labours and his talents. In 1730, he published a newedition of the History and State of Geneva, which had been originally written by David Spon, and printed in two vols. 12mo. The work having already passed through three editions, was committed to Abauzit. Not contented with the mere republication, he corrected the errors, gave two dissertations on the subject, and annexed the public acts and memorials, that were necessary as proofs and illustrations. 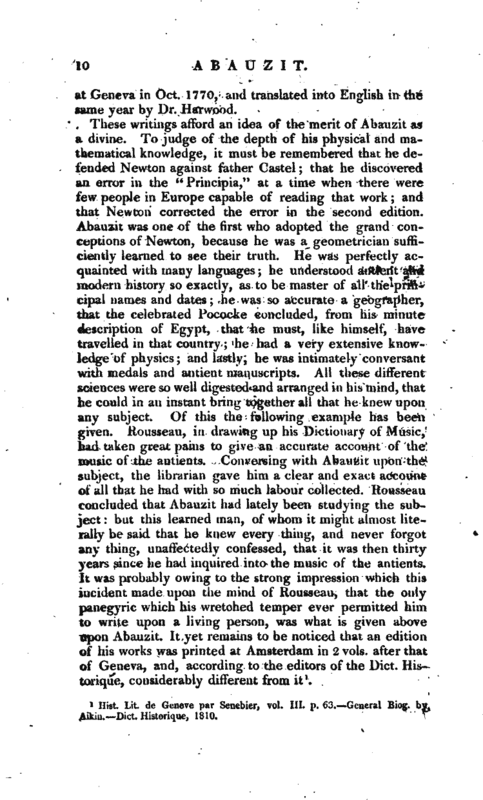 To these were added a copious variety of learned and useful notes, in which he gave an ample detail of facts which were but imperfectly related in the text. Modest himself, he was not ambitious of fame, but assisted others by his labours. Among those who derived benefit from his learning and researches, M. de Meiran alone had the gratitude to acknowledge his obligation. The labours of Abauzit were assiduous, and his knowledge was extensive. While he declined public notice his name was known, and his communications were frequent to most of the celebrated mathematicians, philosophers, and divines in Europe. Notwithstanding the simplicity of his manners, thismoclestphilosopher was not, perhaps, without a small share of vanity. For he employed himself in discovering what to his apprehension seemed errors in the different translations of the Bible. He could believe nothing but what he saw, or was suggested by his own ideas, or could be reduced to mathematical demonstration, and, becoming sceptical, wished to divest’ the scriptures of several miracles. He even made some efforts in poetry; but they were soon forgotten. He is acknowledged to have excelled more in diligence, accuracy, and precision, than in taste or genius. Voltaire, who had as great an aversion to miracles as Abauzit, esteemed and consulted him. As a citizen of Geneva, the | philosopher was active in the dissensions of 1734. He exerted himself in support of the aristocratic party, though he had much of republican zeal. His industry was indefatigable, and he seemed to have written and acted from the conviction of his own mind. In religion he adopted and supported the doctrines of Arianism. Though declining praise, he acquired the esteem of many of the most eminent characters in Europe, and received an elegant compliment from Rousseau: “No,” says he, “this age of philosophy will not pass without having produced one true philosopher. I know one, and I freely own, but one; but what I regard as my supreme felicity is, that he resides in my native country, it is in my own Country that he resides: shall I presume to name him, whose real glorv it is to remain almost in obscurity? Yes, modest and learned Abauzit, forgive a zeal which seeks not to promote your fame. I would not celebrate your name in an age that is unworthy to admire you. I would honour Geneva by distinguishing it as the place of your residence: my fellowcitizens are honoured by your presence. Happy is the country where the merit that seeks concealment is the more revealed.” The reader will appreciate the merit of Abauzit, in proportion to the value he sets on the esteem of Voltaire or the praises of Rousseau. He, however, who could gain the approbation of two such opposite characters, could have been no ordinary person. He died on the 20th of March 1767. Ahauzit left behind him some writings, chiefly theological. Of these the principal was an “Essay upon the Apocalypse,” written to shew that the canonical authority of the book of Revelation was doubtful, and to apply the predictions to the destruction of Jerusalem. 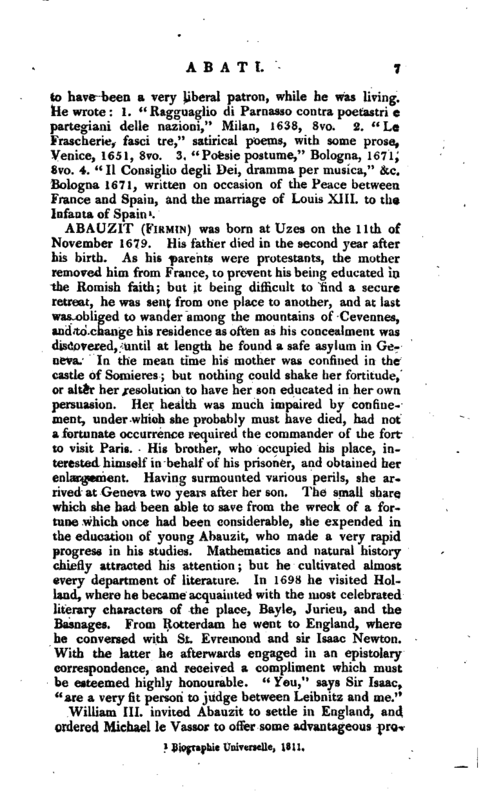 This work was sent by the author to Dr. Twells, in London, who translated it from French into English, and added a refutation, with which Abauzit was so well satisfied, that he desired his friend in Holland to stop an intended impression. 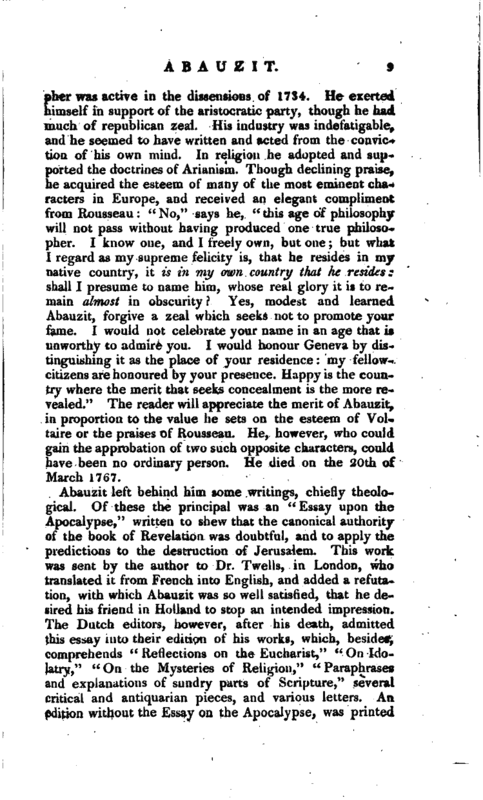 The Dutch editors, however, after his death, admitted this essay into their edition of his works, which, besides, comprehends “Reflections on the Eucharist,” “On Idolatry,” “On the Mysteries of Religion,” “Paraphrases and explanations of sundry parts of Scripture,” several critical and antiquarian pieces, and various letters. An edition without the Essay on the Apocalypse, was printed | at Geneva in Oct. 1770, and translated into English in the same year by Dr. Harwood. Hist. Lit. de Geneve par Senebier, vol. III. 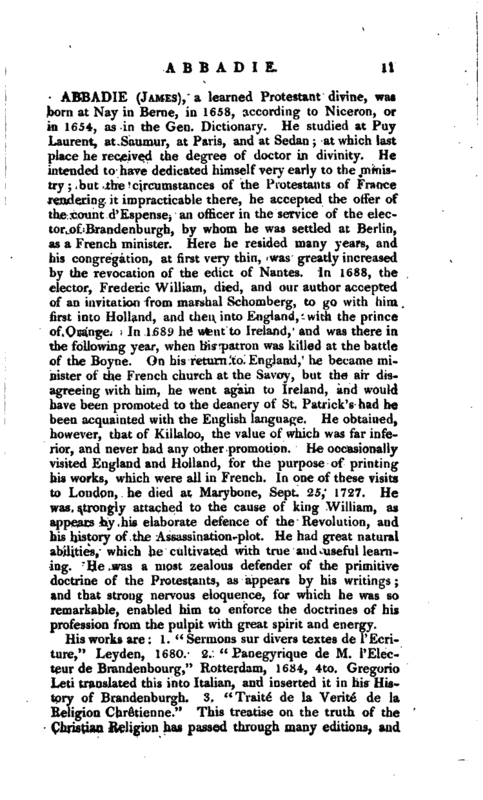 p. 63.—General Biog. by Aikin.—Dict. Hist.orique, 1810.